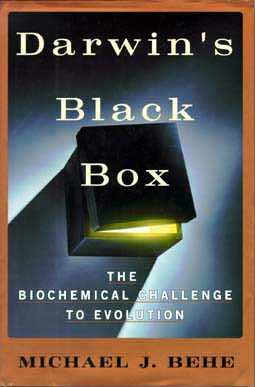 KR Miller's Review of "Darwin's Black Box"
Perhaps the single most stunning thing about Darwin's Black Box, Michael Behe's "Biochemical Challenge to Evolution," is the amount of territory that its author concedes to Darwinism. As tempted as they might be to pick up this book in their own defense, "scientific creationists" should think twice about enlisting an ally who has concluded that the Earth is several billion years old, that evolutionary biology has had "much success in accounting for the patterns of life we see around us (1)," that evolution accounts for the appearance of new organisms including antibiotic-resistant bacteria, and who is convinced that all organisms share a "common ancestor." In plain language, this means that Michael Behe and I share an evolutionary view of the natural history of the Earth and the meaning of the fossil record; namely, that present-day organisms have been produced by a process of descent with modification from their ancient ancestors. Behe is clear, firm, and consistent on this point. For example, when Michael and I engaged in debate at the 1995 meeting of the American Scientific Affiliation, I argued that the 100% match of DNA sequences in the pseudogene region of beta-globin was proof that humans and gorillas shared a recent common ancestor. To my surprise, Behe said that he shared that view, and had no problem with the notion of common ancestry. Creationists who believe that Behe is on their side should proceed with caution - he states very clearly that evolution can produce new species, and that human beings are one of those species. Behe engages in some rhetorical heavy-lifting to support this contention. In the first half of his book the reader is treated to a lively description of some of the most intricate of life's microscopic machinery - the cilia and flagella that produce cell movement, the cascade of blood-clotting proteins, the systems that target proteins to specific sites within the cell, the production of antibodies by the immune system, and the intricacies of biosynthetic pathways. Behe's descriptions of these systems are a delight to read. He is an excellent writer, and describes the complexities of the cell with the flair of a gifted teacher. If all of this has a familiar ring, it should. It is the classic "Argument from Design," articulated so well by William Paley nearly 200 years ago in his book Natural Theology. Behe is candid in his admiration for Paley, and although he takes care to point out some of Paley's mistakes, he leaves no doubt that he views the Argument from Design as his principal logical weapon against Darwinism. To Behe, the intricacy and complexity of natural systems at the biochemical level shows evidence of intelligent design. At its core, Behe's argument is about the mechanism of evolution, which distinguishes him from "young-earth creationists" who deny the validity of the geological ages, the appearance of new species, and attempt to prove that the fossil record is either an illusion or a vast conspiracy. Behe will have none of this, and explicitly denies any connection with "creationism." (5) Nonetheless, he recognizes that his ideas do have theological implications as well as scientific ones. He is not at all modest about these implications, comparing the discovery of design to achievements of "Newton and Einstein, Lavoisier and Schrödinger, Pasteur and Darwin." (6) And he believes that he knows why the scientific community has not embraced intelligent design to explain cellular complexity: "Why is the observation of design handled with intellectual gloves? The dilemma is that while one side of the elephant is labeled intelligent design, the other side might be labeled God." (7) So, according to Behe, design is rejected by the scientific community for the most non-scientific of reasons - its theological significance. Behe has gone two centuries into the past to find the argument from design, dusted it off, and invigorated it with the modern language of biochemistry. But there are problems in this excursion. Not the least of these is the fact that the argument from design has been answered, not once, but many times by writers such as Dawkins, Gould, and even Darwin himself. The multiple parts of complex, interlocking biological systems do not evolve as individual parts, despite Behe's claim that they must. They evolve together, as systems that are gradually expanded, enlarged, and adapted to new purposes. As Richard Dawkins successfully argued in The Blind Watchmaker, natural selection can act on these evolving systems at every step of their transformation. As factual examples we could choose any of the systems whose evolution is documented by the fossil record, a source apparently acceptable to Behe. The three smallest bones in the human body, the malleus, incus, and stapes, carry sound vibrations across the middle ear, from the membrane-like tympanum (the eardrum) to the oval window. This five component system fits Behe's test of irreducible complexity perfectly - if any one of its parts are taken away or modified, hearing would be lost. This is the kind of system that evolution supposedly cannot produce. Unfortunately for "intelligent design," the fossil record elegantly and precisely documents exactly how this system formed. During the evolution of mammals, bones that originally formed the rear portion of the reptilian lower jaw were gradually pushed backwards and reduced in size until they migrated into the middle ear, forming the bony connections that carry vibrations into the inner ears of present-day mammals. A system of perfectly-formed, interlocking components, specified by multiple genes, was gradually refashioned and adapted for another purpose altogether - something that this book claims to be impossible. As the well-informed reader may know, creationist critics of this interpretation of fossils in the reptile to mammal transition once charged that this could not have taken place. What would happen, they joked, to the unfortunate reptile while he was waiting for two of his jaw bones to migrate into the middle ear? The poor creature could neither hear nor eat! As students of evolution may know, A. W. Crompton of Harvard University brought this laughter to a deafening halt when he unearthed a fossil with a double articulation of the jaw joint - an adaptation that would allow the animal to both eat and hear during the transition, enabling natural selection to favor each of the intermediate stages. Is there something special about biochemistry that prevents evolution from doing exactly the same thing to a microscopic system composed of proteins? Absolutely not. But evolution does make a testable prediction with respect to such systems. That prediction is that the degree of similarity in DNA sequences of organisms should correspond to their evolutionary histories. And, as the author is all too well aware, that prediction has been borne out a thousand times over. Despite the close correspondence of gene sequence to fossil sequence, Behe demands that evolutionary biologists should tell us exactly "how" evolution can produce a complex biochemical system. This is a good strategic choice on his part, because the systems he cites, being common to most eukaryotic cells, are literally hundreds of millions of years old. And, being biochemical, they leave no fossils. Once burned, twice shy, Behe may be hoping to avoid the fate of his 1994 claim that there were no transitional fossils linking the first fossil whales with their land-dwelling Mesonychid ancestors (8). Less than a year after that prediction, the existence of not one, not two, but three transitional species between whales and land-dwelling eocine Mesonychids was confirmed. Nonetheless, it is quite possible to rise to the occasion and answer his challenge in biochemical terms. In fact, Russell Doolittle, whose investigations on the evolution of blood clotting are discussed in this text, has done exactly this. Behe is at great pains to disqualify this work, even though Doolittle has not only shown how such a complex system might evolve, but has also produced comparative studies showing how it probably did evolve. In dismissing Doolittle's work, and in preempting any attempt to show how evolution might produce a complex biochemical system, Behe scoffs at the notion that a biochemical system adapted for one purpose might be adapted by evolution for a totally different function, despite physiological examples to the contrary in the fossil record. He dismisses, for example, the notion that the parts of a cilium, including proteins like dynein and tubulin, could have evolved by gene duplication even though similar forms of dynein and tubulin are used for other purposes in the cell. Most cell biologists will be unconvinced by his explanations of why the cilium could not have been assembled from proteins originally used for other purposes - especially since the cilium itself has been adapted for another purpose in one of the very tissues that Behe uses as an example of design - the vertebrate photoreceptor cell. As the book draws to a conclusion, Behe attempts to develop the idea of intelligent design into a testable, scientific hypothesis. This is a lofty goal, but this is also where his argument collapses. Scientific ideas must be formulated in terms that make them testable. Indeed, Darwin himself proposed several ways in which his theory might be tested and disproved. And one of these ways - the contention that organisms contain biochemical parts that could not have been produced by Darwinian means - is the basis of Behe's criticisms of evolution. Being a trained experimental scientist, one would have expected that Behe would have seen the need to do likewise. Unfortunately, he did not. Let's suppose, for example, that a fellow scientist were to take Behe's challenge to evolution seriously, and attempted to show how a specific biochemical system composed of multiple parts could have evolved. A hypothesis for design, formulated in genuinely scientific terms, must be disprovable, and this is exactly the kind of evidence that might disprove it. Incredibly, Behe has intentionally insulated "intelligent design" from this and any other scientific test. How has he done this? In the penultimate chapter of his text, he lists some of the driving forces associated with evolutionary change, including natural selection, genetic drift, founder effects, gene flow, meiotic drive, and transposition (9). Behe states that all of these agents can effect change in biological systems, and admits that they may account completely for at least some of the biochemical features of a living cell. So, if our colleague were to show how these forces could have produced, say, the bacterial flagellum, would he be entitled to say: "I have disproved design?" Not at all, according to Behe. "The production of some biological improvements by mutation and natural selection - by evolution - is quite compatible with intelligent design theory." (10) In other words, any evidence for the evolution of complexity is dismissed in advance as being irrelevant to the problem of design. "Design" exists only when and where evolution cannot explain it! This sterile definition of design means that Behe is free to ignore any conceivable evidence for the evolution of any biochemical system. Such an idea, intentionally placed outside the realm of testability, is not science, whatever the pretentions of its advocates. This means that billions of years ago a humble prokaryote was packed with genes that would be turned off for hundreds of millions of years before they produced the eukaryotic cilium, and genes for blood clotting proteins that would pass more than a billion inactive years in genetic "cold storage." And what happens during those billions of years? As any student of genetics will tell you, because those genes are not expressed, natural selection cannot weed out genetic mistakes. This means that mutations will accumulate in these genes at breathtaking rates, rendering then hopelessly changed and inoperative hundreds of millions of years before Behe says that they will be needed. Contrary to Behe's claims, the evidence of evolution in the fossil record is not irrelevant to his argument. It has forced him, for the sake of consistency, to cobble his acceptance of the earth's well-documented natural history together with the doctrine of intelligent design. The result is an absolutely hopeless genetic fantasy of "pre-formed" genes waiting for the organisms that might need them to gradually appear. This absurdity is the unavoidable result of trying to make "design" conform to that troublesome fossil record. The very same fossil record that provides the primary evidence for evolution. 1) Darwin's Black Box, Page 4.
similar to the end species have been found." page 61. (MJ Behe in Darwinism, Science or Philisophy? © 1994. Thought and Ethics, Houston, Texas). 9) This listing is at the bottom of page 229.